Design 365 Challenge – Design a t-shirt a day to pay the student loans away! I have been selling “print on demand” (POD) t-shirts at Cafepress.com and Zazzle.com for several years now with the goal to use the extra money to pay down my student loans faster. Up until this last year, it hasn’t been a very focused endeavor. I’d create few designs each month and post them with no clear strategy. Just doing it for fun really. 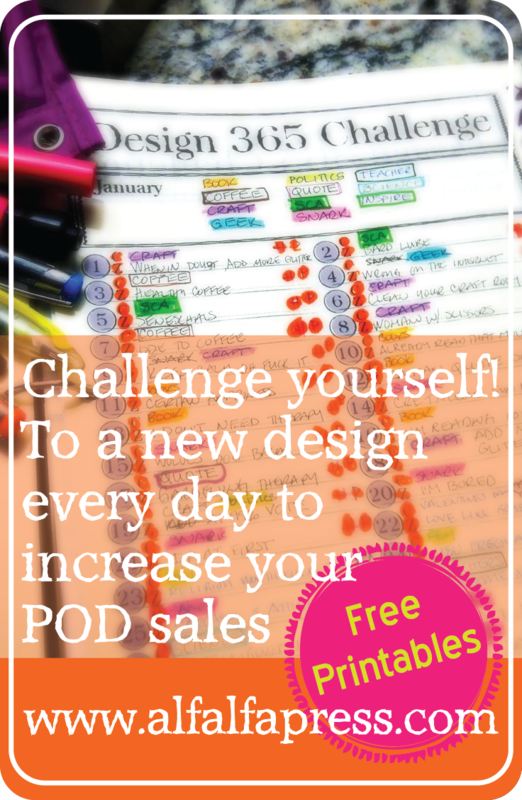 To convince myself to do better this year, I developed the Design 365 Challenge and created printables that you can download. The goal is to make a new design every single day. Or at least have 365 new designs by the end of the year. Join the fun and play along at home and increase your own sales! I started with Cafepress.com in 2005 to sell t-shirt and coffee mugs. I’d sell a few designs now and again, but not a lot. Then last year, I decided to really up my game and spent a great deal of time developing new designs and learning how to market them. All that time and hard work paid off! In fact, I made enough money last year from selling at these two places that I will actually have to pay taxes on the royalties. Um, Yay? No, really it’s good, it’s progress. I have enough business-related deductions that it should offset things so the hit shouldn’t be too bad. (I like good roads and schools, so taxes are ok, too) Maybe future posts will be about taxes (I’m not an accountant but a procrastinating entrepreneur) and more about the business end of well, business. But today I wanted to talk more about something exciting that I am doing this year… the Design 365 Challenge. In December I took a few weeks off to burn down comp time I had accumulated at work. I had a lot of free time to think about how to grow my t-shirt shops. One of the things I was working on was developing a set of planner pages to help organize the business side of things. And I came up with the Design 365 Challenge to keep myself honest and to help track where and when I post. I use an Excel spreadsheet to keep track of my designs, keywords, and descriptions. But I hadn’t come up with a good way to track product development and social media posts. Each Planner page has a free notes space at the top, a monthly calendar with places to show where I create products to sell and where I post to social media. It is has been very helpful to keep the design mojo flowing and it certainly has helped me to get higher on the search index of both Cafepress and Zazzle. I use HootSuite to schedule social media posts and that has been a life saver. I can plan a whole week’s worth of posts before my husband even wakes up on Saturday morning. Woot! Check out my other article on how I am using my t-shirt design business to pay down my student loan!